The Host project contains your AppHost that references and registers all your App’s concrete dependencies in its IOC. It also contains any Web Assets like any Razor Views, JS, CSS, Images, Fonts, etc. that’s needed to deploy with your App. The AppHost is the master project which references all dependencies used by your App whose role is to act like a conduit where it decides which concrete implementations should be used. By design it references everything and nothing references it which as a goal should be kept logic-free. The ServiceInterface project is the implementation project where all Business Logic and Services live which typically references every other project except the Host projects. Small and Medium projects can maintain all their implementation here where logic can be grouped under sub feature folders. Large solutions can split this project into more manageable cohesive and modular projects which we also recommend encapsulates any dependencies they might use. The Unit Test project contains all your Unit and Integration tests. 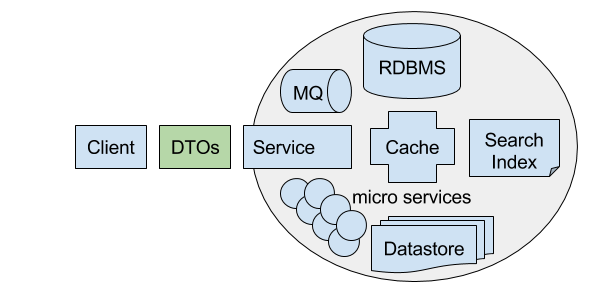 It’s also a Host project that typically references all other non-Host projects in the solution and contains a combination of concrete and mock dependencies depending on what’s being tested. See the Testing Docs for more information on testing ServiceStack projects. Ideally the root-level AppHost project should be kept lightweight and implementation-free. Although for small/prototype projects with only a few services it’s fine for everything to be in a single project and to simply grow your architecture when and as needed. For medium-to-large projects we recommend the physical structure below we’ve modelled after this concrete Events example to describe how we’d typically layout a ServiceStack project. For the purposes of this illustration we’ll assume our Application is called EventMan. 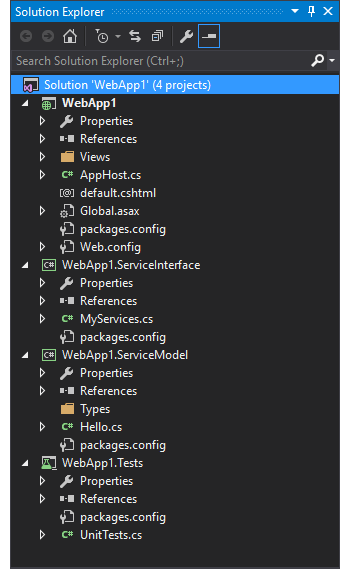 With the EventMan.ServiceModel DTO’s kept in their own separate implementation and dependency-free dll, you’re freely able to share this dll in any .NET client project as-is - which you can use with any of the generic C# Service Clients to provide an end-to-end typed API without any code-gen. The EmailContacts solution details the recommended setup and physical layout structure of typical medium-sized ServiceStack projects. It includes the complete documentation going through how to create the solution from scratch, and explains all the ServiceStack hidden features it makes use of along the way.